Always present but rarely embraced, local skaters would finally get to tell their side of the story at a skateboarding rally last Saturday at Fenton Street Market. However, kids from across the region who came to check it out found an empty tent and a no-show by organizer and activist Maryam Balbed. "She didn't show, she didn't call," says Hannah McCann, who founded the weekly market at Fenton Street and Silver Spring Avenue last fall. She approached Balbed - who goes by the name Sk8ter Mom - about creating a skateboarding event after reading about her push to build a skatepark in Silver Spring in the Gazette last month. Over the past three weeks, Balbed assembled an entire program of videos, photos and demonstrations for the Village Square, a weekly workshop inside the market sponsored by Downtown Silver Spring. Previous events in the Village Square have included everything from a screenprinting demonstration to a design charrette. Saturday morning, McCann says, she e-mailed Balbed after the event was planned to start and no one was there. With a large part of the market sitting empty, she hastily called Sam Locke from the CD-Game Exchange, who was originally planning to display skateboards at the event. Locke got his kids and their friends to skate instead, giving visitors something to watch. Balbed says she and her daughter were forced to leave a "dangerous" house they'd just rented in Silver Spring. Having spent Friday night with friends in Southeast D.C., she had no way to get to the market - or retrieve her things. "How much pain, anguish, and suffering does a child have to experience before it gets to take precedence by that child's mother over a skateboarding event?" Balbed wrote JUTP in a Facebook message. McCann offered the space to Balbed for her event and heavily publicized it - including on this blog - drawing visitors from as far as Reston, Virginia. "We were really disappointed," she says. "We thought this would be a good opportunity for kids in the neighborhood." "It looks bad," McCann says. 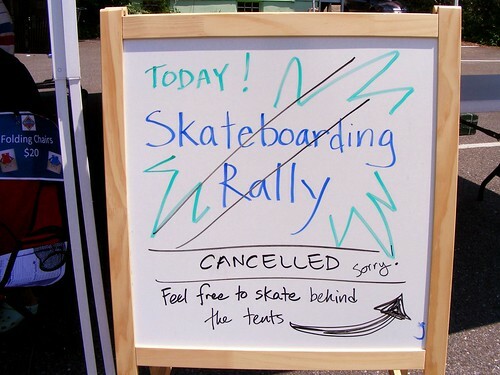 "And it makes the skater kids look bad because they couldn't show up to their own event." "I don't care what Hannah thinks of me," writes Balbed. "If she can't be bothered to understand and respect [my situation], then she simply isn't human." It's a shame last Saturday's event fell through due to circumstances seemingly beyond anyone's control. Skaters, especially young skaters, deserve a chance to stand up and be heard, and it seemed like this rally was a chance to do that. Here's hoping that the local skater community gets more opportunities like this in the future. I know a litrle about area skaters. It seems to me that the "human" thing to do in this situation would be to let the market folks know that you had no plans of showing up instead of making them track you down the day of the event.